After several months of silence, caused to a great extent by my inability to fathom the goings-on of our world, this blogger finally returns to cyberspace, with no solutions at all. But it is time to share my feeling of helplessness about all the current crises on our planet. Who knows, you may well also be suffering from the same syndrome and appreciate reflecting on it. Here I make a start by broaching the crisis that has Europe reeling. It all started (or at least reached a new high) when, last summer, the floodgates opened. A rush of human beings, driven from their homes by lunatic IS jihadists or by the bombs their own governments were chucking, suddenly stood at the borders of the EU, seeking refuge and solace, seeking a safe haven from the hell their homelands had become. And it wasn’t even “just” Syrians, but also folk from Iraq, Afghanistan, Eritrea and many other African countries that set off on a desperate exodus by land and sea in the hope of reaching EU shores. I needn’t recap the events since then, for you are all literate. To have missed what’s been happening, you would have needed to have been on an extended vacation on a distant planet. But just to get us on the same page, and braving the risk of oversimplifying the situation, reactions to these developments have been mixed. As I live in Germany, one of the countries that has been more welcoming than most, I have been reading daily of the ups and downs of dealing with this human inundation. We’ve experienced the rise of certain organizations, mainly in the east of Germany, that reject this migration out of hand as a dilution of their culture and a threat to life as they know it. Is it the fear that they will have less if these people receive help? These groups hover on the verge of fascism; at best they are populists exploiting the situation. The number of attacks on refugee housing in the form of arson has risen greatly, but not just in the east. The only reason refugees have not been killed by these attacks is that they have been carried out on still-empty locations. Is it only a matter of time before the perpetrators become murderous enough to burn down a building full of foreign families? The only good news – but this is a biggie – is that in many, many areas of the country, private support for refugees flourishes. Local authorities have been overwhelmed with the task at hand but are doing what they can as fast as they can. Volunteers in every city and small town (yes, also in the east), who donate their time and efforts to helping these people, have taken up the slack and extended the limited reach of government. Refugees arrive with their world and their families destroyed; the personal involvement of locals like you and me puts a human face on the help offered. When communities open their arms, then there is hope. Russia joined the fray in September, unfortunately on the side of Bashar al Assad, and this has proven to be a game-changer. The bombing sanctioned by our dear and erstwhile best new friend, President Vladimir Putin, has augmented the torrent of migration to Europe. I can just see this character sitting in his office, rubbing his hands with glee at the chaos he has caused within the European Union. And that Union is being sorely tested in its unity by this Völkerwanderung. With several former Soviet satellite states reacting with xenophobic zeal and NIMBY mentally, I can only guess that their exposure to the West has not yet been sufficient. 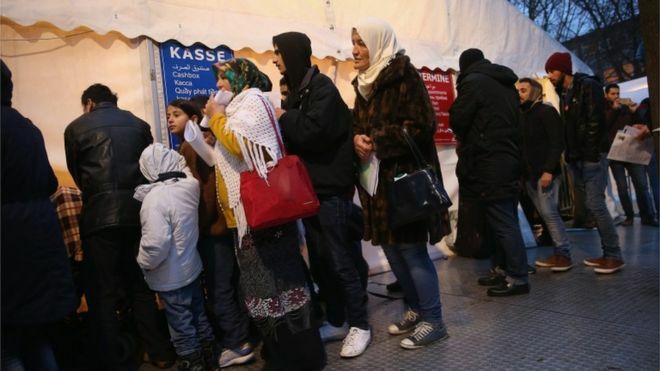 That said, there are enough states in Western Europe that are not exactly opening their arms to the needy! After World War II when Germany lay in ruins, 14 million German refugees from formerly German territories in the east inundated what was left of the country. Those in the west who had survived the war with their houses intact were forced to take refugees into their own homes, and that was the situation for years until more housing was built and people found work. This was not necessarily done cheerfully, according to local stories I’ve heard, but somehow the country was rebuilt, and by the 1950s, Germany found itself in the midst of an unprecedented economic wonder that is the foundation of today’s affluence. The challenge now facing Germany – and any other European nation that takes up the refugee gauntlet – is far easier in some ways than it was in 1945. Even the least economically successful EU countries are in rather better shape than in the aftermath of WWII. Demographic concerns about ageing populations are actually eased by the prospects of an influx of young workers who could be trained and soon be paying into the social security coffers to pay the pensions of us oldies. On the downside, these people come with cultures, languages and religious traditions foreign to most of us. Is this a risk to society as we know it? YES. We are, indeed, at risk of expanding our horizons, of seeing beyond our own borders, of enriching our society with a fresh injection of vitamin C(ulture). And those migrants? They, too, will have to learn our languages, learn about our customs and our religious traditions; they will have to accept the role of women in modern western society. Above all, BOTH SIDES will have to learn to live and let live, to respect each other’s differences, to even rejoice in the recognition that we are not all alike. By the way, I obviously have a migration background, too. After 40 years in Germany, I still feel just a tick more comfortable speaking and writing in English, not to mention watching Hollywood and Brit movies in the original. We have plenty of German friends, but we also have a circle of English-speaking friends with whom we enjoy cavorting. …Carnival, Fastnacht or Fasching, whatever you call it, in German-speaking countries means a tradition of satire. And politics and religion are the favorite targets. But this year, with the terrorist acts in Paris and now in Copenhagen so fresh in everyone’s thoughts, those responsible in Cologne, Düsseldorf and Mainz had to perform a veritable tightrope act when designing the parade floats. Do we stand up and deride / denounce the terrorists for what they are – (mainly) young men dispossessed from our modern affluent society, claiming to murder to defend Allah’s honor? Or in doing so, would we provoke violent responses that endanger the crowds of people – including families with children – who come out for a day of jolly celebrations? What a monumental responsibility to carry! The reaction of the carnival club in Cologne: self censorship. They canceled the first float they created that showed the pen mightier than the sword. The outcry was great. They were bending to the terrorists, some wrote; others defended them for taking seriously the danger to the public. On the day, they did come through with another float that proclaimed the same message. Mainz and Düsseldorf also showed backbone. In Braunschweig were concrete threats of attacks were received, the organizers canceled the parade. What else could they do? Life is becoming, for all of us, a veritable balancing act. Does criticism offend others’ beliefs? Shouldn’t we respect their beliefs and opinions? I was speaking to a teacher friend of mine who said they try to teach the kids to respect the differences in others, whether religious or political or whatever. Then terrorists acts like those in Paris come along and everyone is defending the satirists who are often way past the borderline of respectful criticism. How do you draw a line between what is an acceptable critique and satire that’s gone over the top? We do, in our western democracies, have the freedom and the right to declare our opinions. We must be perfectly clear that the terrorist perpetrators consider every one of us to be infidels and they have absolutely no respect for our freedoms, rights and beliefs. Sorry. Unfortunately, I don’t have a final answer to this dilemma. All I can say is that Kalashnikovs versus words and cartoons is overkill! No one forces anyone to look at the cartoons or read satirical magazines. If it offends you, turn away. But shooting down the authors in cold blood is just not a commensurate response. A little English boy has appeared on the scene to charm us. (1) That the NSA is keeping tabs on us across the world, listening in on our calls, tracking our emails, (watching every time we head for the bathroom). (2) That Edward Snowdon, a man who opened our eyes, is a hunted and haunted figure who may never ever feel safe again no matter what country finally grants him exile. (3) That people are dying daily in their fight for self-determination in the Middle East and in many other parts of the globe. (4) That terrorists somewhere are, as I write, planning the next attack on innocent bystanders. At the same time, in London, a huge fuss is being made over a new-born.On the evening of his birth, he was the only news in Britain. Last night I tuned into the BBC and enjoyed watching Mr and Mrs Cambridge leaving St Mary’s Hospital in London, cradling their one-day-old son. Mr Cambridge opened the door for his wife so she could climb into the backseat of their black, upmarket SUV. Then he jumped into the driver’s seat. Waving to the staff and well-wishers, the Cambridges drove home to their modest apartment at Kensington Palace. These Royals are nothing if not modern. As yet we don’t know his name. No doubt he’ll be christened with a half-dozen of them to choose from, like his fathers before him. And one day he’ll sit on Britain’s throne as head of state. He’ll possess no real power; at best he’ll wield influence. He’ll be drop-dead gorgeous – that, too, is easy to predict! – just like his Mom and Dad. It may take 50 years until he is a reigning monarch, but in twenty years he’ll already bear the title of World’s Most Eligible Bachelor and cause girls of the right age to suffer from severe heart palpitations. You can look on the royal birth – and everything else royal, for that matter – as something quaintly British and slightly past its sell-by date. Or you can see it as one society’s modus vivendi, their way of melding tradition with change. Like the British Constitution and legal system, the British Crown is a perfect example of evolution. I don’t expect to be around when this child steps up to that colossal gilded chair, but I am very curious about how his role will have evolved. And what state will Britain – and the rest of the world – be in by the mid to late 21st century when he succeeds his father to the throne? Not being a science fiction reader, I haven’t schooled my imagination to think along the lines of what could/would/should be in the future. It’s hard enough for me to think in reverse, i.e. to look back from 2013 to the early nineties when cell telephony, personal computers and internet technology were still in their infancy and realize that these developments now shaping our daily lives barely existed then. But if I go beyond the inevitable innovations that technology will thrust upon us, I’m left wondering more about who we will become. Do all the changes change the people, too? And if so, for better or worse? Perhaps it’s a blessing that here and there, some institutions, like the British Monarchy, persist, if only to remind us of how far we’ve come. Yesterday marked the 80th anniversary of the Nazi book burnings that started on May 10, 1933 and demonstrated Hitler’s determination to destroy any form of expression that did not conform to his world view. The workshop I attended was aimed at thinking about how to sufficiantly commemorate this tragedy, but it developed into a much broader discussion. From afar I have been tracking the activities in Wiesbaden for years. Voraciously I’ve read the newspaper articles covering the organized events commemorating the local persecution of the Jews during Hitler’s Third Reich, their humiliation, their banning from professional and civic life, then their eventual deportation to be murdered in concentration camps in the east. 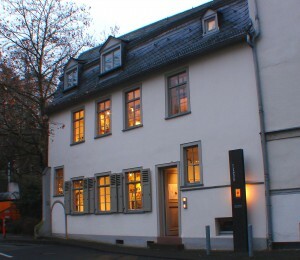 Most of these acts of remembrance have been – and continue to be – planned in conjunction with Wiesbaden’s Aktives Museum Spiegelgasse für Deutsch-Jüdische Geschichte in Wiesbaden (www.am-spiegelgasse.de) (Active Museum Spiegelgasse for German-Jewish History). This museum does not consider itself just a Jewish museum. Located in one of the city’s most ancient buildings that is situated in the historic center of Jewish life, this museum is not a static place for visitors to passively take in exhibitions, but a smaller space offering changing exhibitions (also often at other venues), archives and a library for research. And it is, as its name states, very active, creating an interface between the communities and organizations that make up Wiesbaden. It functions as an integrating force between varied religious confessions and between the young and old. 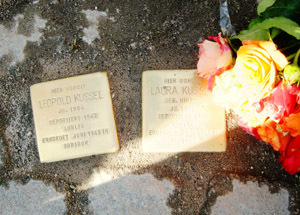 One of the museum’s major – and most visible – projects: is the ceremonial laying of Stolpersteine (stumbling blocks), bronze paving stones set in the pavement in front of the houses where deported Jews once lived. The service held on 4 September 2011 at the cattle ramp aside Wiesbaden’s main train station from where the Jews had to report for deportation. A candle was lit for each of the 1500 deportees. A visiting Israeli said the Kaddish. As a recipient of the museum’s newsletter, I have kept an eye on their activities without participating. Although my interest in all things involving German-Jewish history is evident in the novel I wrote (The Peace Bridge), I’ve always found many excuses for remaining an observer, not the least of which is that I live a half hour away from Wiesbaden. A pathetic excuse. When I received an invitation via the Active Museum to a workshop on the culture of remembrance (co-sponsored by six different Wiesbaden organizations), I decided to end my passivity and sign up. On a rainy Friday afternoon a diverse group of seventeen (age span ca. 18 – 70) gathered to talk about how the horrendous events that occurred during the Nazi regime can/should be commemorated. 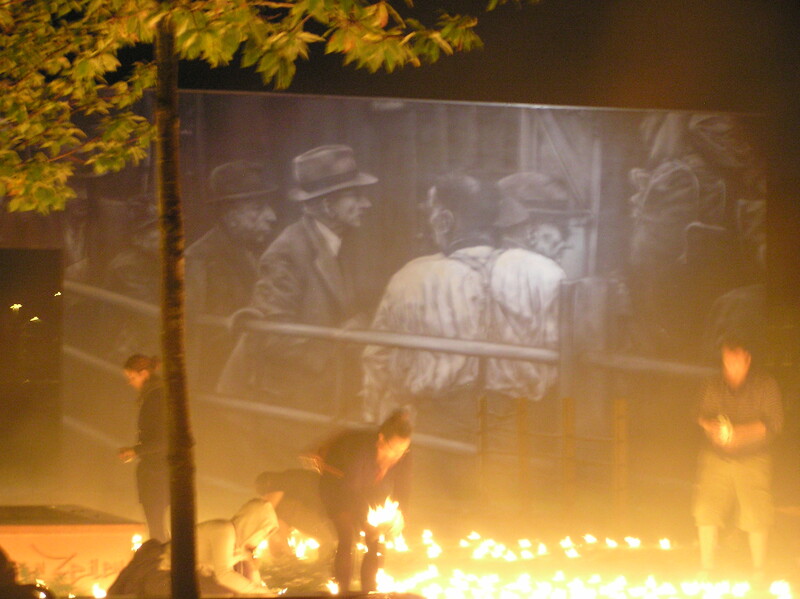 The main focus was on the upcoming eightieth anniversary of the book burnings which began under Hitler on 10 May 1933 (just three months after he came to power). Could there be a greater symbol of the attempt to ban free thought from the world than the burning of books? What kind of a commemorative event could sufficiently relate the significance of this act to the internet generation coming of age in the 21st century? Can they even imagine the possibility of losing the right to free expression and publication? However, the focus of the workshop shifted very quickly to a re-think of the act of commemoration in general. How can it be carried out without it becoming an empty ritual? How can the youth of today be included in remembering historical events that they either don’t know or care about, or would perhaps rather forget? And how do we build a bridge from that past to make it relevant to the present? The afternoon ended with a lot of open questions. One could denounce such workshops as “debating societies” with little practical use. But as my years of observing the Wiesbaden scene has shown me, there are a lot of people in the sponsoring organizations (including the Active Museum) who go to great lengths to find the ways and means of remembering an infamous past so that it might never happen again. My hat off to them! We never did get around to talking about the forgetting part of the workshop title. I’ve concluded it isn’t an option. With the success of Burns’ Suppers across Germany – and I believe in lots of other places, too – it makes me wonder exactly why this event has become so popular. Surely the significance of Burns’ poetry from over two centuries ago, mostly written in a dialect that needs translating for even us native English speakers to understand it, can’t be the true reason. With growing globalization, where more and more countries and peoples are becoming “homogenized”, Anglo-Saxon-ized, and losing touch with the culture that is their natural habitat, does it indicate a need to return to traditions almost lost? Or is it in itself a part of the globalization process? Are we successfully being sold a product, a lifestyle? Or is it just a great evening out, a chance to dress up and drink whisky? What do the Scots out there have to say? Or anybody else, for that matter. Some men in bow ties and dinner jackets, others wearing skirts shorter than most of the women have on. That was the scene Saturday night at the Masonic Lodge in Frankfurt (Main) that has served for 5 years running as the place to be come late January around the date of Rabbie Burns’ birthday. On this evening real-live-Scots and some wannabes, plus fans of Scottish country dancing and, above all, lovers of whiskey, donned their glad rags for a humble supper of haggis, neeps ‘n’ tatties. 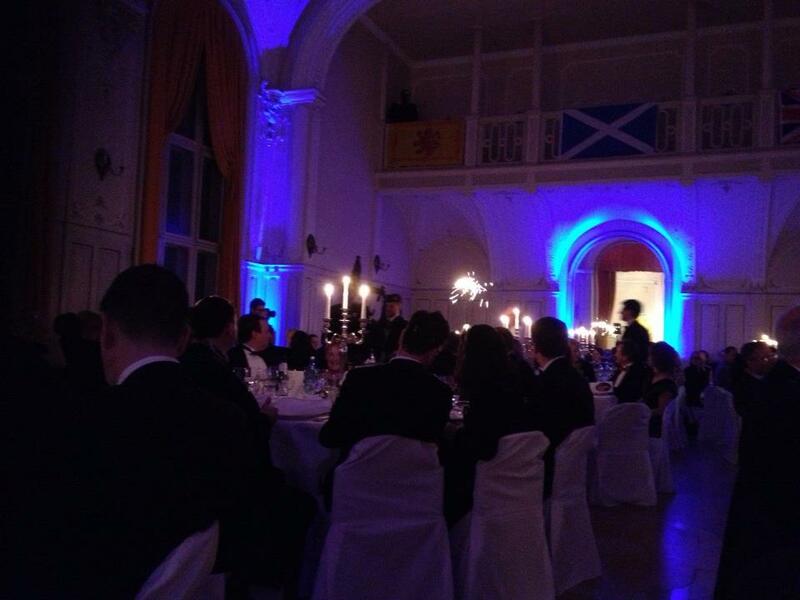 For the last four years, we have attended the Burns’ Supper, organized by the British Chamber of Commerce in Germany, and think it a grand event for kicking off the year. Of course, a true Scot would have already done that on New Year’s Eve by celebrating Hogmanay, but this serves us foreigners magnificently. As guests approach the Masonic Lodge on the Kaiserstrasse, they are greeted by the sound of bagpipes and drum. The next greeting comes in the form of a golden nectar served in the foyer. I’m not a whiskey drinker – although I love sniffing it – but this time they are offering a Glenlivet, a smooth and mild tipple that even I savor. Besides being a sociable evening with friends, the event revolves around Celtic traditions and the veneration of Scotland’s best-loved poet. 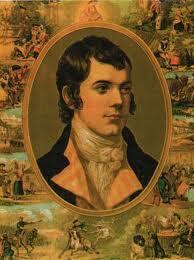 Robert Burns (1759-1796) is a cult figure among his compatriots. Despite his short life and his modest roots, he wrote poetry and lyrics in the Scottish tongue but also sometimes wrote in a more accessible dialect or standard English. Rabbie was especially known as a lover of lassies and good whiskey. Which may partly explain his early demise. Back to the haggis: For the uninitiated a haggis is a sheep’s stomach stuffed with ground innards, oatmeal and onions that is boiled in water and served with neeps (turnips) and tatties (potatoes). Considering I don’t generally eat innards, I find it tastes surprisingly good. Which must mean it tastes nothing like liver, heart and whatever. After the soup it’s time for said haggis. The piper pipes, the drummer drums and a procession enters the hall with the cook carrying the haggis aloft on a silver tray decorated with super-sized sparklers to electrify the darkened room. Then Clark McGinn, a genuine Scot flown in for the job, takes center stage and addresses the haggis by enacting Rabbie’s poem (“reciting” would be too understated a term). For us mere mortals, the only hope of understanding the words lies in reading the text in the program as Clark holds worth. (Sometimes the German translation is the only clue to the meaning.) Yet that would be a shame. Far better it is to listen to the sound of the archaic words and their musicality and watch the performance by a master of the art. At that moment the actual meaning is secondary. After hunger has been satisfied and while thirst is still being addressed, the speeches begin. Andrew McNeill is the man of the evening. Andy is the incarnation of everything Scottish: full dress kilt, jacket and sporn. A beret is perched atop his white mane that flows unstoppably into his long fluffy beard. I spoke to him in the foyer at the outset and he told me he’d be speaking but it would just be ad lib. Well, he may be a Scot, not an Irishman, but he sure possesses the gift of the gab. He entertains us regally. His tales of Rabbie, spoken in a Scottish that even I can comprehend, are interspersed with the poet’s songs sung by Craig Herbertson, a man with a perfect voice for Burns’ music. The next tradition follows: The address to the lassies by Clark McGinn, followed by the address to the laddies by Sarah Kelso. Both speakers understand their subjects and gladly tease and cajole with faint praise and well-aimed barbs. There’s nothing more to be done but reconcile the opposite sexes on the dance floor. The Frankfurt Scottish Country Dancing Club takes over and instructs the many willing participants in various choreographed dances. What feels like chaos at the start becomes a lilting dance experience. And the American in me clearly identifies the heritage from whence our square dancing developed. But end the evening must, and how else but with a circle of guests singing Auld Lang Syne. For some inexplicable yet understandable reason, Burns’ Suppers are proliferating all over Germany. Let’s charge our glasses and raise them for a final toast to Rabbie who made the world a more entertaining place and to the British Chamber of Commerce in Germany – especially to Susan Tackenberg and Neville Anderson – who sponsor and organize the event each year. Thanks so much for a glorious evening. WHERE’S THE HOLIDAY SPIRIT GONE THIS YEAR? "John, don't just do something—stand there!"